Paraxerula americana is an impressive xeruloid mushroom from the Rocky Mountains, where it appears in July and August on the deadwood of quaking aspen. 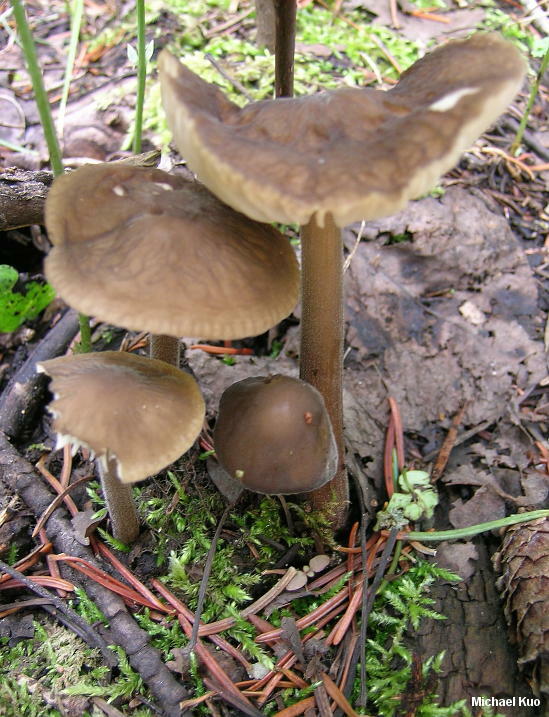 Look for the dark brown, finely fuzzy surfaces of the cap and stem, and the long tap root extending underground or into the rotting wood. 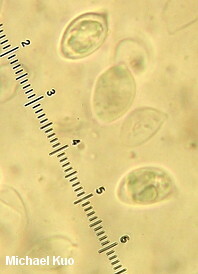 Since it is the only xeruloid species in its range, Paraxerula americana is not likely to be confused with morphologically similar species (eastern North America's Hymenopellis furfuracea, for example, can look similar), but its pileosetae and comparatively small spores separate it easily from other xeruloid species. 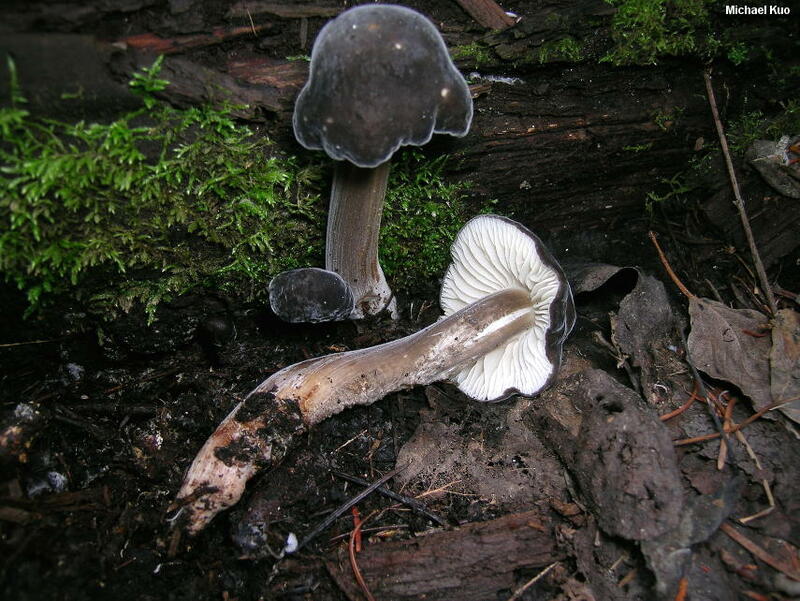 Oudemansiella longipes var. americana and Xerula americana are synonyms. Ecology: Saprobic on the deadwood of quaking aspen; growing alone, scattered, or gregariously, directly from very well decayed logs and stumps or attached to buried deadwood near stumps, appearing terrestrial; July and August; apparently limited to the Rocky Mountains, from New Mexico and Utah to Idaho. The illustrated and described collection is from southwestern Colorado. Cap: 2.5-7 cm; bell-shaped or irregularly convex when young, becoming broadly bell-shaped, broadly convex, or nearly flat; finely velvety when young, becoming more or less bald; smooth, or moderately radially wrinkled; dry; very dark brown (nearly black) when young, becoming dark yellowish brown to grayish brown or yellow-brown; usually manifesting a sheen in all stages of development; the margin incurved when young, sometimes uplifted in maturity, becoming faintly lined. 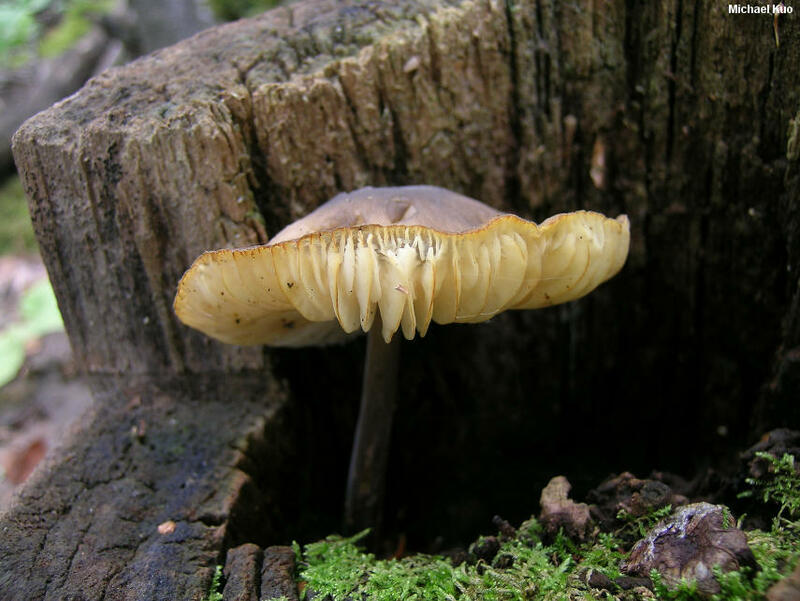 Gills: Narrowly attached to the stem; nearly distant; white to creamy at first, becoming pale yellow; thick; short-gills frequent; cross-veins present. 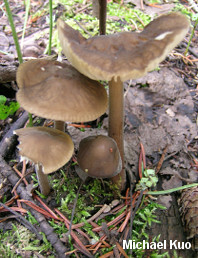 Stem: 6-10 cm long above ground; 0.5-1.5 cm thick; tapering a little to apex; brown to grayish brown and finely velvety to hairy throughout development; sometimes staining yellow to rusty orange where handled; with a long, tapered tap root extending up to 12 cm underground; the tap root sometimes bruising rusty brown. 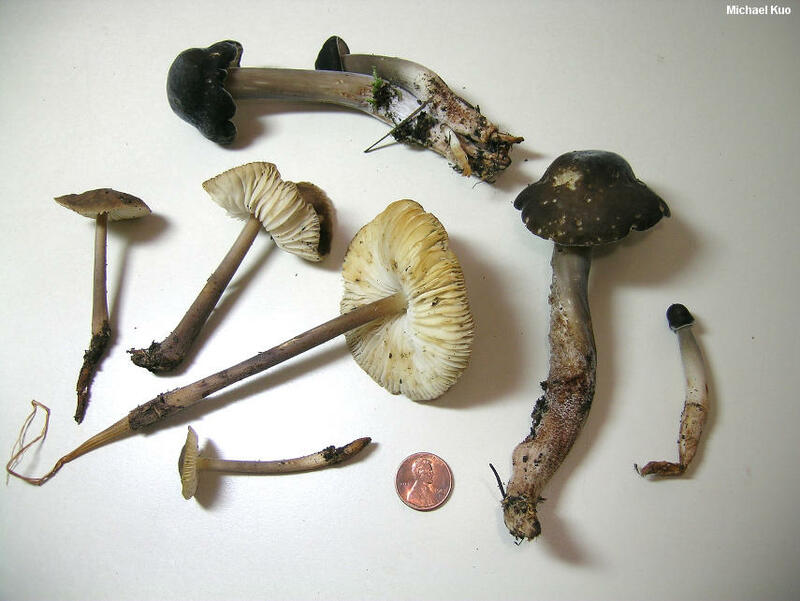 Dried Specimens: Gills of dried specimens become dingy yellowish to very pale orangish after several years in storage. Microscopic Features: Spores 9-12 x 5-8 µ; ellipsoid to very subtly amygdaliform; smooth; hyaline in KOH; inamyloid. 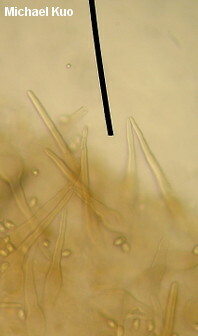 Pleurocystidia infrequent; fusoid, with or without a neck; hyaline; to about 75 x 15 µ. Cheilocystidia utriform to clavate or subcylindric; up to 70 x 15 µ; hyaline to golden in KOH. Pileipellis hymeniform; elements subglobose-irregular to pyriform; pileosetae frequent, thick-walled, brown in KOH, up to 200 x 20 µ.
REFERENCES: (Dörfelt, 1981) R. H. Petersen, 2010. (Mitchel & Smith, 1978; Pegler & Young, 1987; Redhead, Ginns & Shoemaker, 1987; Petersen & Hughes, 2010.) Herb. Kuo 08071001.